Click here to listen to Kara's music via Kara's streaming audio player. The player will open in a new window, and will continue to play as long as you leave that window open. Kara Barnard's music is rooted in the Midwest. Her early work on "Cheshire Cat Moon" has a strong folk influence, with stories and images of her Green County, Indiana upbringing and later residence in the hills of Brown County. Her first album with highly regarded metal guitarist, Troy Seele, "The Water's Edge" has a harder feel and a more alternative sound, but one begins to sense Kara's growing interest in bluegrass. Their next release, "Home" has songs with folk and alternative influences, but the bluegrass flavor becomes more pronounced. 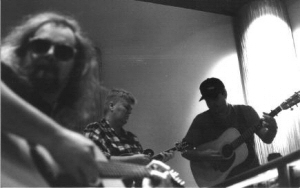 Kara with Troy Seele (standing) and Frank Dean working on the Sindacato album "Logan County" which she co-produced with Frank. "Fret Hopping in Brown County," released in 2002 is Kara's first solo instrumental effort. On it her fretwork is masterful and the sound is pure bluegrass. For the next few years Kara collaborated with Miriam Davidson and Kiya Heartwood of the band "Wishing Chair." Kara toured extensively during this time, playing many large folk and women's festivals. The collaboration culminated in the release of the folk-rock and bluegrass influenced album "Dishpan Brigade." "Kara Barnard is a fine instrumentalist whose talents have graced recordings by many artists as well as her own releases. 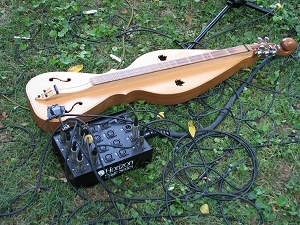 Often when a performer takes a do-it-all-yourself approach to a recording, it becomes readily apparent that they are more comfortable with one instrument over another. This is not the case with Kara. Although she is a fine guitarist she also shines on mandolin, octave mandolin, Autoharp, mountain dulcimer and banjo." 2007 saw the release of "Flying Down King Street" with several new tracks and many of her previously released favorites. Kara has been working with her sister, Pam Barnard Hays, for years. You can hear Pam's backing vocals starting on "Cheshire Cat Moon." But the collaboration has taken on a new emphasis as they began performing together as The Barnard Sisters, both in the Midwest and South Carolina. Though you will still be aware of strong bluegrass influences on "Flying..." the folk presence and feel is back. Kara Barnard has shared stages with many incredible talents including side player duties for Tret Fure, Jamie Anderson, Wishing Chair, Ferron, Lisa Koch, Edie Carey, Sindacato and Slats Klug with impromptu festival closers with Holly Near, Cris Williamson, Alix Dobkin, Irene Farrera, Ember Swift, Alix Olson, Sabrina Mathews, Vicki Shaw and Lucie Blue Tremblay. You never know exactly when or where Kara’s going to show up on stage! 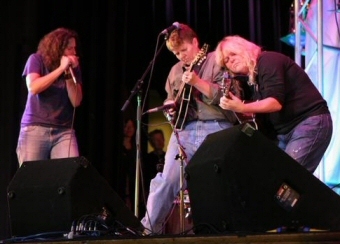 Trina Hamlin, Kara, Kiya Heartwood onstage at the NWMF in Illinois. Kara has been featured on 5 nationally televised PBS specials, and she was the headlining act at the 1997 International Book and Music Fair in Bogota, Colombia. She has opened shows for Dave Matthews, James Taylor, Wynonna, REO Speedwagon, Fleetwood Mac, and Pat Benatar on the Indianapolis Verizon Plaza Stage, Janis Ian, lori b, Carrie Newcomer, Adrian Legg and others at various midwest venues. 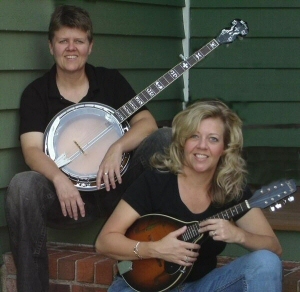 Kara has performed at many of the country’s biggest venues including the Down Home in Bristol Tennessee; The Ark in Ann Arbor, Michigan; Charlotte’s Web in Rockford, Illinois; and festivals from Kansas to New York, Michigan to Florida. 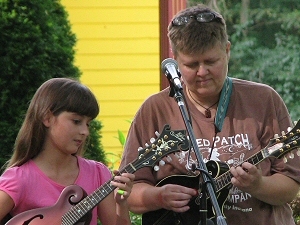 Past women's festival performances include the National Women’s Music Festival, Indiana and Ohio - Sisterspace, Darlington, Maryland - CampOut, Ferncliff, Virgina - Tomboy Girl Fest - Madison, Wisconsin - Knowing Women Fest, West Virginia - Southern Women’s Music Festival in Georgia and Florida - Autumnfest, DeKalb, Illionois - Iowa Women’s Fest, Iowa City, Iowa. Kara offers a variety of workshops and performances throughout the year. You can see her mostly in the Midwest and South Carolina. Check the Barnard Sister's Facebook events page for some upcoming Barnard Sisters events. Contact Kara to get on her email list for more performance/workshop dates. Booking information can be obtained by contacting Kara.